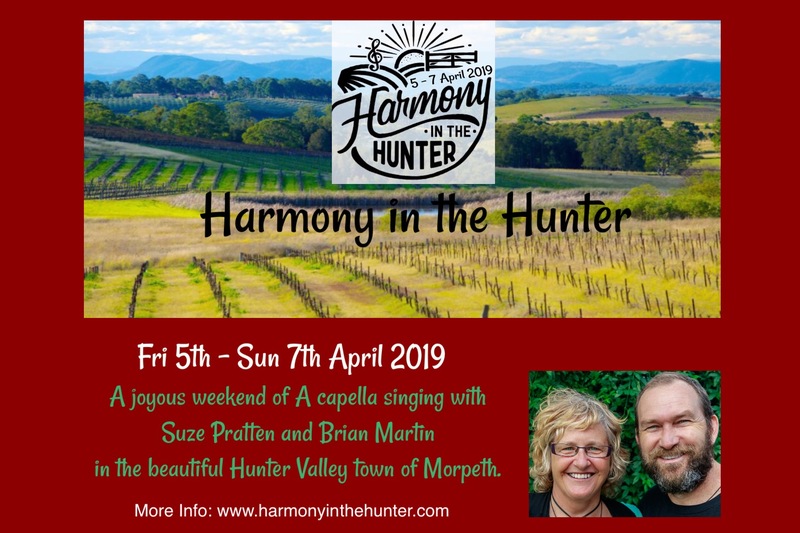 Harmony in the Hunter is an annual singing weekend held in the gorgeous township of Morpeth. The weekend is lead by well known song leaders Brian Martin (Sunshine Statesmen) and Suze Pratten (Stay Tuned) and is suitable for both beginner and more experienced singers alike. Dates for the weekend are April Fri 5th - Sun 7th 2019. Both Suze and Brian are highly accomplished choir leaders and apart from loads of group harmony singing, the weekend will focus on techniques for getting more from your voice, holding your harmony and bringing out the polish in the sound. You can also expect plenty of lovely happy smiling faces, an open mic night at the pub, our Finale fundraising concert and the usual warm feelings of good cheer and delight we get when we sing, sing, sing! We would love you to join us for Harmony in the Hunter - it promises to be a wonderful musical experience and it's happening in your backyard! Choir leaders are welcome to join us for the whole weekend at half price. You are are invited to attend for the whole weekend workshop or just to sing (with your choir!) in our Finale Concert on Sunday afternoon 7th April at St James in Morpeth. The concert will be a Fundraiser held at the end of the workshop and will feature the Harmony in the Hunter Singers (formed over the weekend!) and some other local choirs. I hope to see you (and your choir!) there for some gorgeous singing, a heap of fun and hanging out with friends old and new. PS please feel free to pass this info on to friends and other choirs in your networks - thanks so much.